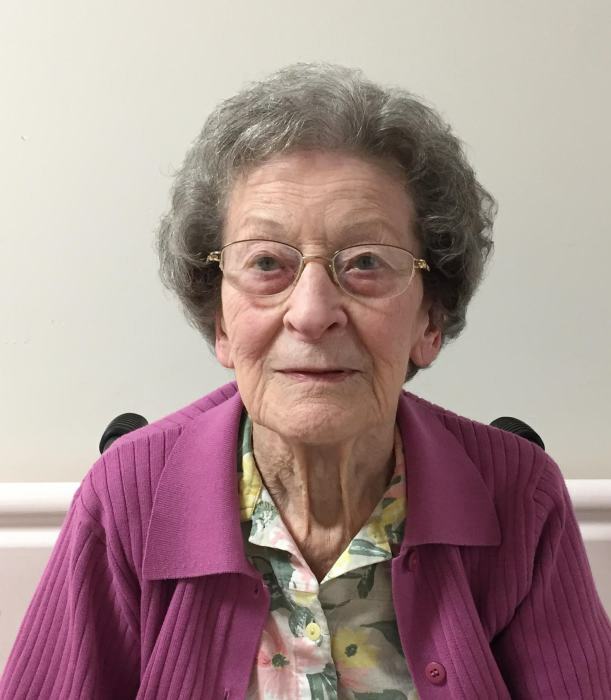 Dorothy Eva Magill passed away at the Lamont Health Care Centre on November 29, 2018 at the age of 94 years. Dorothy was born on March 30, 1924 and was the youngest of three children. She had two brothers, Cyril, and Randolph. She grew up at the Bailey homestead near Hemaruka Alberta. Dorothy either walked to school or rode her horse. In the winter she would leave early for school to put coal in the heater so the school would be warm before classes started. When she completed school she worked in Hemaruka at the general store which was also the post office. She has fond memories of her time at the store, sorting the mail and serving customers. She later worked at a store in Coronation. On June 6, 1948, at the age of 24, Dorothy married Robert Magill. They moved to the original homestead of Robert’s parents, Cassie and Hugh Magill. Faye was born in 1949, Murray in 1952 and Donna in 1954. Dorothy planted a large garden, and preserved vegetables for the winter and canned many jars of fruit. She loved flowers and always included them in her vegetable garden as well as around the house. She took pride in her home and yard. When we started taking piano lessons mom drove us to Hemaruka, Coronation and then to Castor every Saturday for many years. She always packed a lunch for us to eat on the way. I think she did enjoy a little shopping while we were at our lessons. Dorothy was active in the Hemaruka WI and made many sandwiches and pies for events held at the Hemaruka Hall. Dorothy also enjoyed the trips to Red Deer where she could head out shopping while Robert attended the Farm and Ranch show. She enjoyed her time with the grandkids and great grandkids and always had lots of special treats for them and never missed sending them a birthday card. Dorothy and Robert moved from the farm to the Hanna Lodge in 2011. In March of 2017, Dorothy moved to the Lamont Health Care Centre to be closer to Faye and Donna. Dorothy is survived by her two daughters. Faye (Terry) Strashok and Donna McIntyre. Daughter -in-law Marlene Magill. Grandchildren Darwin (Olivia) Strashok, Mark Strashok, Ian (Jody) Magill, Dwight (Christy) Magill, Brandy (Chris) Paton, Ryan (Char) McIntyre. Great grandchildren Emmett and Gemma Strashok; Hudson and Ryker Magill; Raena Paton; Henry and Stella McIntyre. She will be missed by her nieces and nephews: Barbara Swyripa, Richard Bailey, Margie Glazier, Joyce Magill-Evans, Hugh Magill, Dale Magill and Laurie Best. Dorothy is predeceased by her parents Frederick and Selena Bailey; brothers Cyril and Randolph Bailey; sister-in-law Esther Bailey; husband Robert Magill; son Murray Magill; brother-in-law Stanley Magill and sister-in-law Laura Magill. With Dorothy’s passing we see the end of an era. She lived in a time of homesteaders and pioneers of absolute self reliance and strong bonds of community. We will miss you mom. Honoring Dorothy’s request, a private family service will be held on Saturday December 8, 2018 at the Veteran United Church. Memorial donations may be made to the Village of Veteran Cemetery Society. Funeral Arrangements in care of Coronation Funeral Home, Coronation, Alberta. Phone: 403.578.2928.